The first Shodan search that I remember people sharing like wildfire on Twitter was for an HP LaserJet printer. 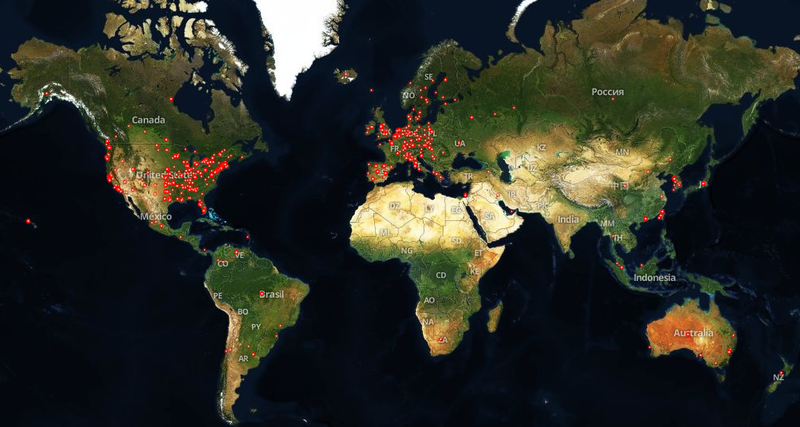 In the early days of Shodan, before all the SCADA devices came to light, the majority of searches were for consumer devices such as printers, routers and webcams (the latter are still widely popular). Inspired by a cool new tool from @info_dox I decided to start crawling the Internet specifically for printers using the Printer Job Language protocol on port 9100. 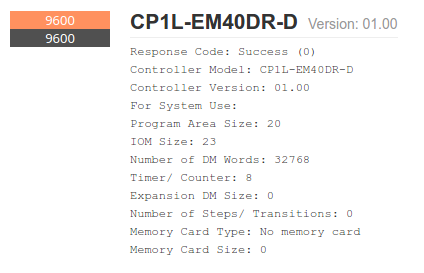 Obviously there aren’t as many of these devices out there as web servers, but within a few hours I had gathered enough to start analyzing the data and see what sort of cool stuff I can learn. The surprise standouts in that list are South Korea and Taiwan, I expected the devices to follow the general distribution as for other services (i.e. United States > China > Mexico > Russia > Germany). Not surprisingly Universities have a lot of printers, but they appear to be more exposed than one would anticipate. 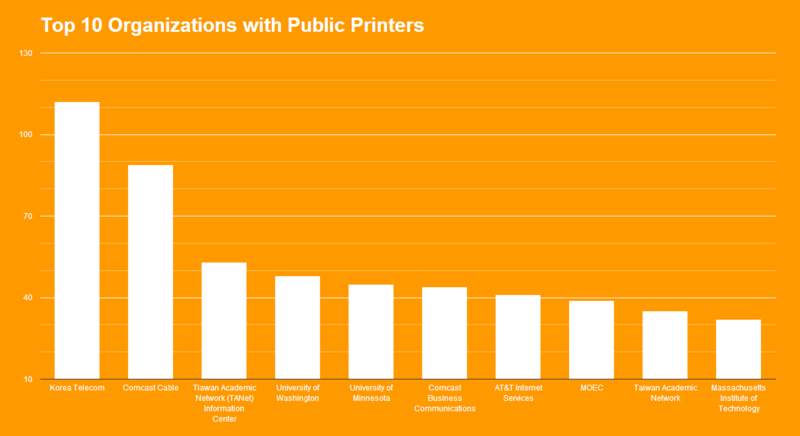 Out of the top 100 organizations running public printers, 58 of them are universities and another 4 are academic institutions. That means roughly 2/3 of all publicly exposed printers so far operate on an academic network. The above explains why Taiwan is so high on the list of countries that have publicly available printers: the Taiwan Academic Network and its Information Center have nearly 100 printers online. It looks like they’re single-handedly putting Taiwan on the map! It’s also interesting that there are so many devices on Korea Telecom’s network, I don’t have a good explanation for that. If anybody has any explanation for why there are so many in South Korea and on Comcast, please let me know. At the time of writing the top position was shared between the University of California San Francisco and University of Pennsylvania with 4 printers needing toner each. They were narrowly followed by University of California Santa Cruz with 3 printers. There is a very long tail of organizations that need to replace the ink on 2 printers, with a total of 137 printers that need a replacement. 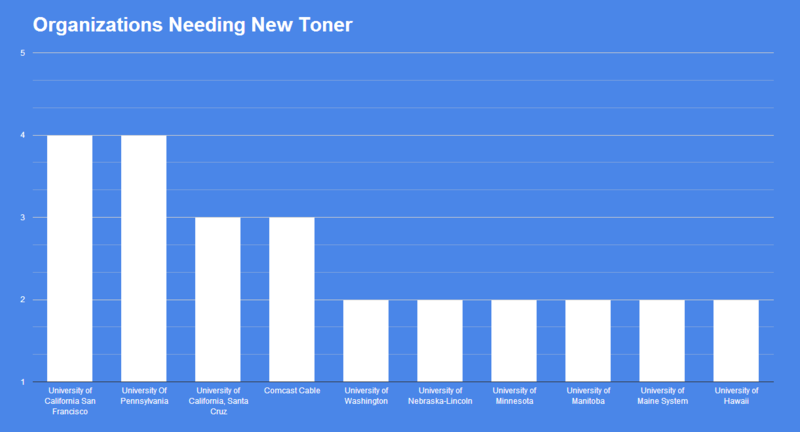 I will be watching these numbers develop over time (using a Google Spreadsheet), and I could theoretically also determine when the toner has been replaced which I might do in a follow-up post. Until then, enjoy the data and let me know if you discover anything interesting!